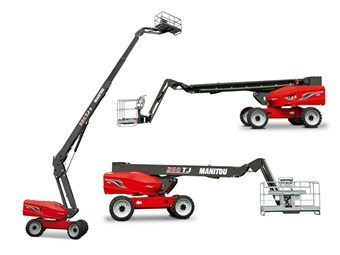 Aimed at customers who need to reach great heights in cramped conditions, the Manitou 260 TJ is a compact, self-propelled telescopic elevated work platform (EWP) that can lift up to three people to a height of 26 metres. Manitou's 260 TJ telescopic access platform. "An elevation structure on an articulated fulcrum on the TJ access platforms makes it possible to get really close to buildings for a better working area and productivity gains," according to Manitou, a French company that also makes scissor platforms, mast platforms and articulated access platforms for the construction, agriculture and industrial sectors. The company has aimed to give the 260 TJ the highest level of manoeuvrability on cluttered construction sites by keeping the dimensions down to just 2.42m wide and 10.8m long, and by including all-terrain characteristics such as four steering wheels and a crab mode. The access platform is also fitted with a jib. "The undeniable success of the 280 TJ over the last two years motivated us to broaden our range of self-propelled solutions for lifting to great heights," Maniaccess range marketing manager Samuel Viaud says. "Particularly dedicated to fitting metal roof structures or renovating buildings and facades, the 260 can also be used in trimming trees or fitting windows," Viaud adds. Three people can work in the 260 TJ’s 400kg-capacity basket over the whole of the machine's load chart. Combined with electronic management of engine speeds by stages, Manitou says the 45-horsepower (33.6kW) Kubota engine certified to Euro III A emissions standards "allows linear translation of the basket when telescoping the boom, ensuring comfort and safety for the operator while limiting the environmental impact (reduced consumption and noise)". "The electronic management contributes to making horizontal or vertical movements of the basket during application along the wall of a building," the company adds. "These simulated movements are produced by a unique system of hydraulic flow management." On the safety front, the TJ telescopic access platforms and ATJ articulated access platforms now feature Manitou’s EN 280-comp-liant Safe MAN System, which secures the operator in case of crushing. "A sensitive bar is placed in front of the access platform's control panel," the company explains. "When the access platform is active and pressure is applied to the sensitive edge, the automatic function cut-out immediately stops all movements. "Immediately, an alert message appears on the display in the turret, an alarm sounds and a blue flashing light comes on. The working environment is therefore warned very quickly. "What happens then? The operator has a choice of two solutions. If he is conscious, he can press the reset/re-initialisation button (bypass button) or if he is unconscious, it is possible to take control of the machine from the controls at the base of the access platform." 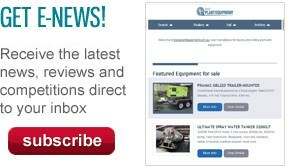 Click here to find elevated work platforms for sale.